Venezuela’s state-run oil company, PDVSA, has fallen months behind on shipments of crude and fuel under oil-for-loan deals with China and Russia, according to internal company documents reviewed by Reuters. The delayed shipments to such crucial political allies and trading partners – which together have extended Venezuela at least $55 billion in credit – provide new insight into PDVSA’s operational failures and their crippling impact on the country’s unraveling socialist economy. Because oil accounts for almost all of Venezuela’s export revenue, PDVSA’s crisis extends to a citizenry suffering through triple-digit inflation and food shortages reminiscent of the waning days of the Soviet Union. The total worth of the late cargoes to state-run Chinese and Russian firms is about $750 million, according to a Reuters analysis of the PDVSA documents. 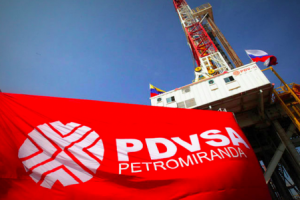 At the end of January, PDVSA was late on nearly 10 million barrels of refined products that the company owes the firms – with shipments delayed by as much as 10 months, according to the documents. It also failed to make timely deliveries of another 3.2 million barrels of crude shipments to China’s state-run China National Petroleum Corporation (CNPC). Shipments to China and Russia are critical for PDVSA’s financial health because firms from the two countries purchase about a third of the PDVSA’s total oil and fuel exports. The administration of Venezuela president Nicolas Maduro has for years relied on credit from the two nations, particularly China, to finance infrastructure and social investment in Venezuela. PDVSA did not respond to requests for comment. Venezuela’s Petroleum Ministry declined to comment. During the decade-long oil boom that ended in 2014, Venezuela borrowed nearly $50 billion from China that it agreed to pay back in crude and fuel deliveries to state-run Chinese firms. Venezuela was the seventh largest crude supplier to China in 2016 and the largest in Latin America. Russia’s state-run Rosneft (ROSN.MM) lent at least $5 billion under similar arrangements, but the details of those deals have not been disclosed. Now, PDVSA is struggling to make good on those promises. A total of 45 cargoes bound for Russian and Chinese companies are late for a variety of reasons, according to internal operational reports about shipments of crude and refined products. The problems include operational mishaps, such as refining outages and delayed cleaning of tanker hulls, and financial disputes with service providers owed money by PDVSA. The backlog of delayed or canceled fuel cargoes represents about three months of the 88,000 barrels per day (bpd) of jet fuel and diesel that PDVSA must deliver under financing deals to Russia’s Rosneft (ROSN.MM), China’s PetroChina (601857.SS) and ChinaOil. Rosneft, the Kremlin and the Russian Energy Ministry declined to comment. In Beijing, Foreign Ministry spokesman Lu Kang said China paid great attention to its relationship with Venezuela. “What I can tell you is that at present Venezuela’s providing of oil to China to repay the loan is basically normal,” Lu told a daily news briefing. PetroChina did not respond to requests for comment, and ChinaOil, a unit of PetroChina, declined to comment. The Chinese commerce ministry did not respond to requests for comment. The delayed deliveries suggest that PDVSA will struggle this year to meet a planned increase in shipments to China and other countries, as laid out in a broad strategy document seen by Reuters. That document said PDVSA aims to boost crude deliveries to China by 55 percent in 2017, in part by reducing exports to India by 15 percent. Last year, the company produced about 2.5 million barrels a day, lowest in 23 years, and this year’s production projections are virtually unchanged, according to the PDVSA strategy document. An internal PDVSA email exchange from Nov. 21, between PDVSA executives in charge of loading operations, details a myriad of operational and financial problems that are delaying the cargoes it owes Chinese and Russian customers. In one of the emails, a company official said PDVSA was unable to deliver a 1.8 million-barrel cargo of fuel oil to PetroChina because Bahamas terminal Borco, where PDVSA rents storage space, has intermittently prevented the firm from using the tanks since 2016 due to lack of payment. Another 2 million-barrel cargo of fuel oil bound for China in November was postponed because of stained crude tankers, which cannot navigate international waters due to environmental regulations. The emails also discussed potential delays to a fuel oil cargo for Rosneft, also because of dirty tankers and unpaid bills. Separately, four cargoes of Venezuelan Boscan crude owed to China’s CNPC have also been postponed this year. The fall in crude prices has made the oil-for-loan agreements more onerous. Because loan payments were negotiated when crude prices were higher, the agreements require PDVSA to ship more oil in order to continue servicing the debts at the same rate. That saps its ability to ship to other customers – such as India, or customers in the United States – who would pay in cash, which PDVSA desperately needs. “PDVSA is taking a legal risk by postponing cargoes to key customers and a financial risk if it also delays deliveries to customers who pay by cash,” said Francisco Monaldi, fellow in Latin American energy policy at Baker Institute in Houston. The top buyer of Venezuelan crude in India is Reliance Industries (RELI.NS), operator of the world’s biggest refining complex. The company imported 353,000 bpd of Venezuelan crude in 2016, 5 percent less than a year ago. To replenish its heavy sour Venezuelan crude supplies, it has stepped up imports from Mexico, Iraq and Saudi Arabia. If PDVSA can’t meet its obligations to Russia and China, Monaldi said, the countries could recover money through projects or assets outside the oil sector, he added. The Chinese and Russian financing schemes, however, offer Venezuela and PDVSA more repayment flexibility than they get from the holders of $50 billion in bonds they have sold to investors. Because of default concerns, yields on those bonds are currently among the world’s highest, paying an average of 21 percentage points more than benchmark U.S. Treasury bonds. China and Russia, which have provided unwavering support for Venezuela in diplomatic forums, have stayed quiet about any misgivings with Caracas. The problem of delayed cargoes would most likely be discussed discreetly through diplomatic channels, analysts said. An escalation into a commercial dispute, with Chinese or Russian firms demanding prompt payments, could affect Venezuela by triggering default clauses on bonds, or lead PDVSA to lose control of U.S. subsidiary Citgo, almost half of which was pledged to Russia as collateral. While that scenario is unlikely, PDVSA clearly does not have enough oil or money to satisfy its many creditors, said a trader who works at a company that regularly buys Venezuelan oil.